ELZET80´s modular computer series TSM clips easily to a standard control cabinet rail. The CPU module already includes everything to start with: power supply for up to 14 extension modules, serial communication ports and some process I/O. The modular expandability without any bus boards or cradles offers the utmost flexibility - especially for small quantity applications. It comes with a built-in real-time kernel - programmable in C - and a large set of i/o-functions like counters and pulse devices. DinX is a cheap rail mount single boarder for a typical distributed control application: it can be programmed in C for autonomous operation using the mCAT real time kernel to create BITBUS user tasks. For simple remote i/o operations the standard RAC/GBS task provides immediate access to all i/o. The 24V optoisolated inputs can be used as counters, the 24V outputs directly drive valves at up to 500mA with short-circuit protection. Powerful universal processor core for "embedded control" applications. Plug it to custom base boards with drivers, relays, connectors etc., that - by their low complexity nature - usually can be manufactured using standard bi-layer pcb technology. Combined with the pre-configured real time kernel this approach helps keeping time-to-market short. Features: 128K (512K) RAM w. 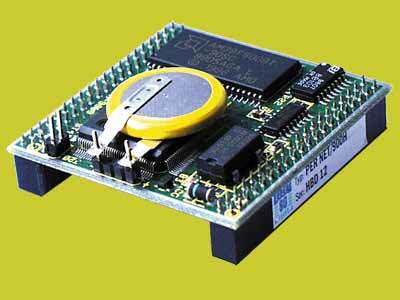 Batt., 1MByte Flash, 16-Bit TLCS900H microcontroller, Z16C32 SDLC Controller for BITBUS. 8 timers 8 bit, 2 counter/timers 16 bit, 8i/2a analog, 4 µDMAs, 2 stepper motor /universal parallel ports, 2 UARTs. Control and acquisition unit with native Bitbus. Connects 96 I/O; up to 854 I/O using additional units. DICO-188 is an industrial controller which can handle 96 I/O points (up to 854 I/O, when combined with DICO-028 expansion units). A terminal block is hinged to the front so as to make wiring very simple. The unit comes with a special mount to be bolted to the rear of the service board. 16+16 PNP digital I/O and 4 slots for DICO I/O modules (up to 64 more I/O). Optional serial I/F: RS232, RS422/485, Current Loop, CANbus. Connects 48 I/O; up to 96 I/O using DICO-058. DICO 508 is a control and/or acquisition unit which can be integrated in a Bitbus or CANbus network. It can manage 48 I/O points (up to 96, with DICO-058 expansion unit). Reduced dimensions and contained costs. 16+16 PNP digital I/O and one slot for DICO I/O module (16 more I/O points). Control and acquisition. Connects 32 I/O; up to 64 I/O using DICO-078. DICO 708 is a control and/or acquisition unit which can be integrated in a Bitbus or CANbus network. It can manage 32 I/O points (up to 64, with DICO-078 expansion unit). It has reduced dimensions and contained costs. 8+8 PNP digital I/O and one slot for DICO I/O module (16 more I/O points).